Theater Solutions R4G Indoor / Outdoor Weather Resistant Granite Grey 2 Speaker Set. Fill your outdoor deck, garden or patio with high quality sound. These Theater Solutions granite style 2-way weatherproof rock speakers are manufactured from high tech plastics, rubber and other materials that have been extensively tested for durability. Theater Solutions R4S Indoor / Outdoor Weather Resistant Sandstone Brown 2 Speaker Set. Fill your outdoor deck, garden or patio with high quality sound. These Theater Solutions sandstone style 2-way weatherproof rock speakers are manufactured from high tech plastics, rubber and other materials that have been extensively tested for durability. Theater Solutions R8G Indoor / Outdoor Weather Resistant 8" Granite Grey 2 Speaker Set. Fill your outdoor deck, garden or patio with high quality sound. These Theater Solutions granite style 2-way weatherproof 8" rock speakers are manufactured from high tech plastics, rubber and other materials that have been extensively tested for durability. Acoustic Audio RSS6BT Powered Bluetooth Wired Outdoor Sandstone 6.5" Rock Speaker Pair. Fill your outdoor deck, garden or patio with high quality sound. These powered Bluetooth wired Acoustic Audio sandstone style 2-way weatherproof rock speakers are manufactured from high tech plastics, rubber and other materials that have been extensively tested for durability. Theater Solutions R4S Indoor / Outdoor Weather Resistant Sandstone Brown 4 Speaker Set. Fill your outdoor deck, garden or patio with high quality sound. These Theater Solutions sandstone style 2-way weatherproof rock speakers are manufactured from high tech plastics, rubber and other materials that have been extensively tested for durability. Theater Solutions R6G Indoor / Outdoor Weather Resistant 6.5" Granite Grey 2 Speaker Set. Fill your outdoor deck, garden or patio with high quality sound. These Theater Solutions granite style 2-way weatherproof 6.5" rock speakers are manufactured from high tech plastics, rubber and other materials that have been extensively tested for durability. Acoustic Audio B4RS Outdoor Sandstone Weather Resistant Speaker Pair. The Acoustic Audio B4RS outdoor rock speakers are the perfect combination of style and function, these rock speakers are ideal for both indoor and outdoor applications. Theater Solutions RBBT4GGV Add-On Fully Wireless Powered Bluetooth Outdoor Granite Grey Rock Speaker. This Vice Speaker CANNOT Be Used By Itself - You Must Have Theater Solutions Master RBBT4GGM Speaker For This Speaker to Work. The Acoustic Audio G4RS outdoor rock speakers are the perfect combination of style and function, these rock speakers are ideal for both indoor and outdoor applications. They will dress up your patio, garden or pool area and their granite rock design will blend seamlessly with other outdoor décor. Full range 200W speaker. 2" mylar tweeter. 8" woofer driver. Natural Rock finish - Slate. This unique speaker was designed to provide the best high performance and aesthetically pleasing beauty in an exterior speaker system. Acoustic Audio RSG8BT Powered Bluetooth Wired Outdoor Granite 8" Rock Speaker Pair. Fill your outdoor deck, garden or patio with high quality sound. These powered Bluetooth wired Acoustic Audio granite style 2-way weatherproof rock speakers are manufactured from high tech plastics, rubber and other materials that have been extensively tested for durability. TIC Corporation -. This unique speaker was designed to provide the best high performance and aesthetically pleasing beauty in an exterior speaker system. Realistic natural stone finish to blend beautifully with any exterior garden setting. 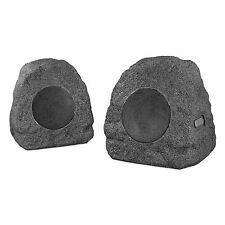 TIC Corporation - 150W 6.5" Outdoor Rock Speakers (Pair). 2x full-range 150W drivers. This unique speaker was designed to provide the best high performance and aesthetically pleasing beauty in an exterior speaker system. Full range 360° 200W speaker. 2" Mylar refractive Tweeter. 8" Co-Axial Woofer Driver. This unique speaker was designed to provide the best high performance and aesthetically pleasing beauty in an exterior speaker system. Genuine Sonance SoundHenge III Sandstone Outdoor Rock Speaker Enclosure. Part#: 91891. Color: Sandstone. This is just a speaker enclosure, no speakers included . LOCAL PICK UP. Full range 360° 200W speaker. 2" Mylar refractive Tweeter. 8" Co-Axial Woofer Driver. Natural Rock finish - Slate. This unique speaker was designed to provide the best high performance and aesthetically pleasing beauty in an exterior speaker system. Fill your outdoor deck, garden or patio with high quality sound. These Theater Solutions sandstone style 2-way weatherproof 6.5" rock speakers are manufactured from high tech plastics, rubber and other materials that have been extensively tested for durability. KLH Audio Outdoor Landscape Rock Speakers RSP 160. people just deciding they can find a better deal or just change their mind. And a claim isn't fun to have to place which is why we are saying this in advance. Theater Solutions RBBT6GM Fully Wireless Powered Bluetooth Outdoor Slate Grey 6.5" Rock Speaker. Theater Solutions Vice RBBT6GV Speakers Will Only Work with Theater Solutions Master RBBT6GM Rock Speaker. Theater Solutions R4G Indoor / Outdoor Weather Resistant Granite Grey 4 Speaker Set. Fill your outdoor deck, garden or patio with high quality sound. These Theater Solutions granite style 2-way weatherproof rock speakers are manufactured from high tech plastics, rubber and other materials that have been extensively tested for durability. Theater Solutions R8S Indoor / Outdoor Weather Resistant 8" Sandstone Brown 2 Speaker Set. Fill your outdoor deck, garden or patio with high quality sound. These Theater Solutions sandstone style 2-way weatherproof 8" rock speakers are manufactured from high tech plastics, rubber and other materials that have been extensively tested for durability. TIC TFS5 Specifications.  2x full range 150W (peak) drivers. 65W / 150W.  3 natural rock finish options: Canyon, Slate, White Granite. TIC Manufacture One-Year Limited Warranty . A pair of performance rock speakers to enhance any exterior landscape setting. This lot is for a pair of Dual LUR66E outdoor rock shaped speakers. Up for sale is one Niles RS8SI PRO Granite 8" HD Outdoor 2-Way Rock Speaker (Each) FG01697. This stealthy speaker imitates an actual rock to blend in seamlessly with the surrounding landscape. It sports a 6-1/2" woofer for deep, punchy bass and two 3/4" tweeters for crisp highs. This dual-tweeter design allows the '650-SM to play both channels of a stereo signal with precision and clarity. TIC TFS-10 Outdoor Rock Speaker Features 2" Tweeter. 8" Co-Axial Woofer Driver. Color: Canyon. Rock Style 6.5" Indoor/Outdoor Waterproof Stereo Audio 2-Way Speaker 120W. Power: 120W max. 6-1/2" Double cone speaker. 1x 6-1/2" double cone speaker (Rock Style). Health & Beauty. Speaker wire: 20" long. TIC Manufacture One-Year Limited Warranty . 2" Mylar refractive Tweeter. 8" Co-Axial Woofer Driver. Natural Rock finish with 3-color options: Canyon (CN), Slate (SL) or White Granite (WG). A multi-use performance rock speaker to enhance any exterior landscape setting. Providing high signal-to-noise, durability, and low distortion, the TIC TFS-6CN are your ticket. Sports fanatics, talk show followers, and drama lovers alike can take pleasure in the style and fidelity of these main stereo speakers. TIC Manufacture One-Year Limited Warranty . 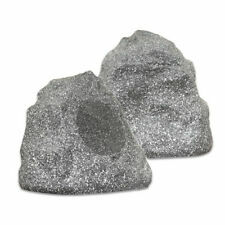 A pair of performance rock speakers to enhance any exterior landscape setting. Baseplate mount waterproof cable connector. 8Ω standard (optionalSP70vTA external switchable 70v system). Acoustic Audio B6RS 600 Watts Sandstone Outdoor Weatherproof 6.5" Rock Speaker Pair. Acoustic Audio B6RS Outdoor Sandstone Weather Resistant Speaker Pair. Waterproof and Weatherproof against Salt, Rain, Snow, Ice and Pool Chemicals. 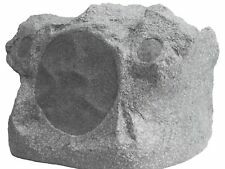 Outdoor Rock Speakers Sonance Hometech 100 watt Landscape 2-way 8ohm NIB COOL!